FotoVideo was founded in 1996, as a modern, European-style magazine under the name Advanced, with support from Czech photofair Interkamera. After a few months, its name was changed to FotoVideo. In around two and half years, FotoVideo caught up with the top photo magazines in Czech and Slovak republics. In 2006, FotoVideo won first prize in respected award ‘Magazine of the Year’ organized by the Czech Publishers´ Association. 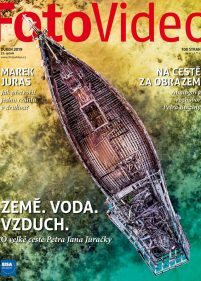 FotoVideo is now the top selling photo magazine in the Czech Republic and focuses on the most modern digital techniques and the best of Czech and international photography. It is aimed at people who love photography and appreciate the beauty of a great picture, as well as those who are interested in new technologies and who follow news in the fields of photography, video and imaging. FotoVideo runs the largest annual photography competition in the Czech Republic and Slovakia, called the Photographer of the Year. FotoVideo offers articles aimed at helping readers with their technique, monitors the latest developments in all the fields of photography and photographers, practical help, tests and portfolios. Around 70% of readers are male, well educated, young-to-middle age and have a modern European outlook.